This pull-push system incorporates the advantages and benefits of both negative and positive pressure arrangements in a single system. These systems are used where there are multiple material entry points, and multiple delivery points. A very common application is the unloading of a standard railcar. Since the cars cannot be pressurized, air is pulled from the outside, through the car (carrying solids with it) to a filter. Then after the filter, a blower can be used to forward the solids to the final receiver. If the final receiver is next to where the rail car is being unloaded it may be practical to use a complete vacuum system. 3. transfer line including piping, elbows; divert valves (flex-tube diverters, wye - diverters, plug diverters and other line diverter configurations). 2. Use wear resistant materials for more prevalent abrasive materials - Sand, carbon black, etc. 1. Do not use sloping pipe runs. The refluxation, (run-back and re-conveying of the same material), will require the pipe to re-transfer the product slipping back on top of its normal load, and the effect is accumulative. At best it will significantly increase the conveying burden, but is more than likely tend to block the lower bend. 2. Allow a 'reasonable' horizontal conveying length before the first bend to allow the bulk material to accelerate to a stable conveying speed and reduce the sectional loading of the conveying pipe. Material slowed by the bend occupies a greater proportion of the pipe's cross sectional area and thereby offers more obstruction to the air flow, which increases the pressure drop along the system. 3. Do not fit bends close together on the pipe run for reasons similar to the above. 4. Consider stepping the pipeline on long runs. Air expands with pressure drop, so velocities inevitably increase along a constant pipe run. Higher material velocities increase wear on bends and product degradation. 5. 'More air' can be 'less transfer capacity in dilute phase systems. Larger solids and gas frictional losses caused by higher gas velocities can absorb more energy than the extra input of energy. There is an optimum gas flow rate for a given lean phase flow system. Check with a specialist for the correct solids / gas ratio balance and top performance. 6. Product damage and wear at bends is very material dependent. Blind Tee does usually have much merit, but cause a higher pressure drop than long radius bends. 7. Rotary valves do leak and also pass air differentials through the returning empty pockets. They also tend to fill with product on one side of the valve as the empty pockets are rotated to present a space for material to flow in. Back flow of gas and biases intake causes many feed problems. Make sure that the valve is properly vented and that the feed channel is of good form for flow across the whole cross section. A short inlet standpipe is useful for such duties as a cyclone outlet or a feed into a high pressure line. 8. Check that cyclones have an unobstructed outlet. If there is intermittent or periodic discharge, allow clear buffer capacity to avoid interfering with the cyclone operation. 9. Allow for the pressure drop on the supply line to the blower. Include an allowance for any filter, silencer, acoustic box or compressor enclosure and extended supply run, as may be appropriate. Be sure to compensate for the temperature increase due to gas compression. 10. Provide adequate instrumentation; this is essential to know what is going on and to facilitate a proper investigation of any problems that may arise. In a dilute phase conveying system, the product is transported by lift, or suspension, of the individual particles in the air stream. As the velocity is subsequently reduced, the larger particles cannot sustain this lift and they begin to fall from suspension to the bottom of the pipe. The technical term used in the industry that describes the velocity at which particles fall from suspension from the air stream is "saltation velocity". Unlike dilute phase conveying systems that typically use larger amounts of air to move relatively small amounts of material at high velocities in suspension, dense phase offers he enormous advantage of efficiently "pushing" a much denser concentration of bulk solids at relatively low velocities through a conveying line. The best, single description for identifying if a system is dense phase is whether the product velocities in the pipe are designed to be operating below the saltation velocity. The number one reason to apply a dense phase design is when the product being handled is highly friable. Many products within the food industry fall into this category. As an example, if a consumer opens a bag of cheese puffs and finds them broken, he will quickly change loyalty to the brand. Broken pieces do not command the salable price and are usually discounted for wholesale use. The cost effect of material damage due to degradation can be huge and preventing degradation is thus a high priority especially in food processing and canning operations of meat lumps, softened grains and vegetables etc. By virtue of the low velocity characteristics, the next best application for dense phase is transportation of highly abrasive materials. The higher velocities associated with dilute phase conveying can lead to rapid pipe wear. Many materials such as sand, alumina etc. are so abrasive that they can wear a hole in a pipe elbow in just a few weeks. The pipe wear can also result in a contamination of the product. There is really only one other main reason for selecting dense phase. This is typically found within the plastics and petrochemical industry. Some of the softer plastics, such as polypropylene and polyethylene, will smear onto the pipe wall when the product slides along the outer wall of an elbow in a dilute phase transport system. The plastics will actually melt from the frictional contact with the pipe wall and will leave a long thin layer of material. The layers are peeled off into strips and re-entrained into the system. These strips are commonly referred to as a "streamers" and they will quickly build up in awkward places and stop product flow. Dense phase transportation will eliminate the streamers that are commonly associated with dilute phase conveying. The main principle of a dense phase conveying system is to slow down the velocity of the product in the pipe to a point that is below the speed at which the product breaks or degrades. At low velocities, the product lies for periods of time in the bottom of a horizontal line and it is blown under pressure to the discharge point in slugs or plugs. The dense phase pneumatic conveying systems uses low volume, medium pressure air stream and relies on a continuously expanding volume of air pushing cohesive slugs of material along the pipe. This system uses a transfer vessel / pump tank to feed the material into the conveying line. It is a batch system with plugs of material separated by cushions of air. The velocity range at the source can be as low as 200 fpm for the majority of products. The product velocity at the destination is always a function of the system differential pressure, but in most cases it rarely exceeds 2000 fpm. Dense phase technology reduces the air consumption to the absolute minimum by allowing the system to convey at maximum density. This maximum density conveying technique has three main advantages. 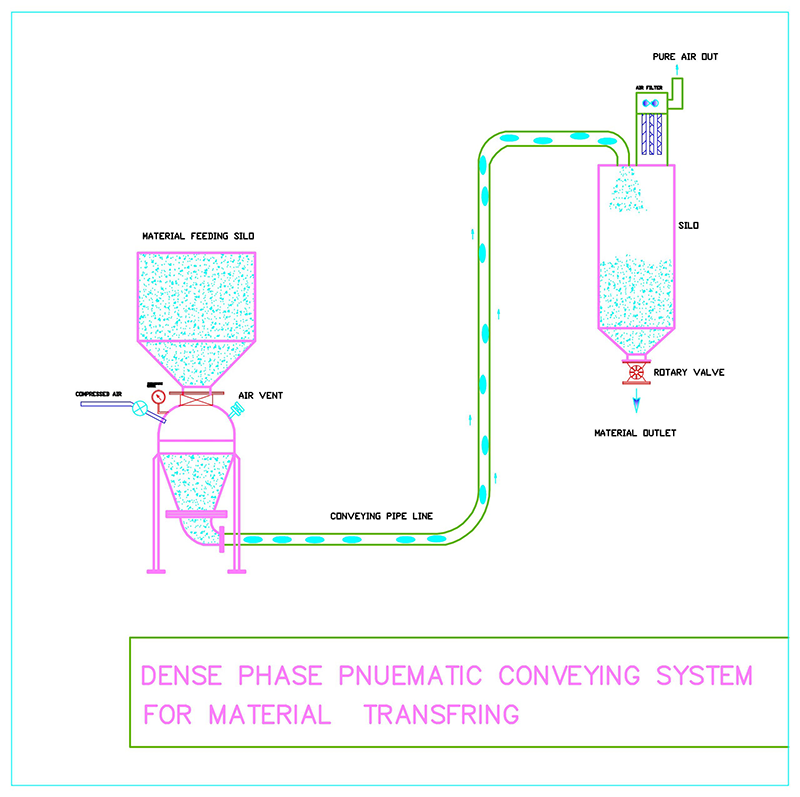 The following different modes of dense-phase conveying are in use. All the manufacturing, Fabrication and machining of the equipments is carried out as per relevant Indian / International standard. The quality control personal check every product as per relevant Quality Assurance plans procedures before dispatched. We provide excellent reliable sales and service. Electromech pneumatic conveying system, are guaranteed for a period of 12 month from the date of shipment against any manufacturing defects, when properly installed, operated and service in accordance recommendations. System Wear And Tear Is Not Covered By The Guarantee.